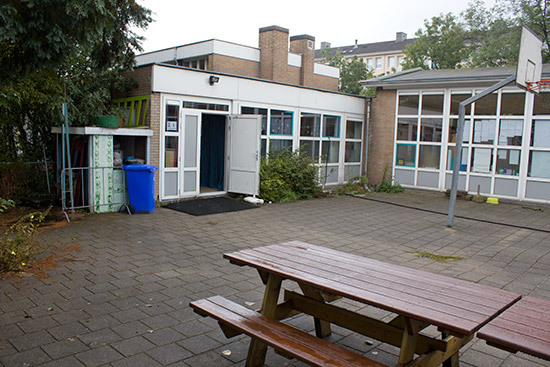 Locations: De Heldringschool, Burgemeester Eliasstraat 20, 1063 EW Amsterdam, North Holland, Netherlands. 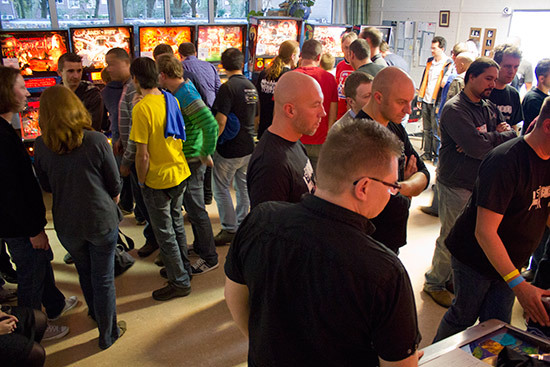 Being a national organisation, The Dutch Pinball Association (NFV) likes to hold its main annual show and tournament in a different part of the country each year. This year it returned to the nation's capital for the first time since 2007. 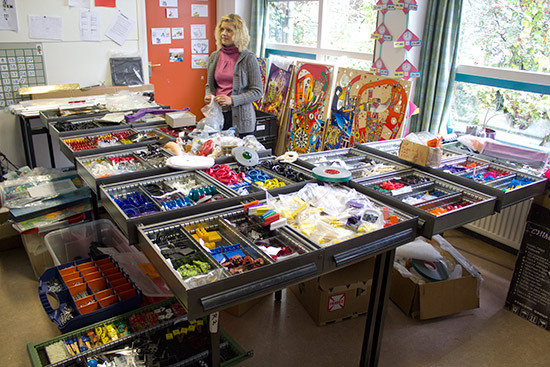 The location was the Heldringschool on the western outskirts of the city. Entry to the DPO main tournament required pre-registration and pre-payment. The entry fee was €17.50 ($22.33) - the same as last year - but competitors also had to purchase weekend entry to the DPO event which was another €15 for members of the NFV or foreign visitors. Dutch players who weren't members of the NFV had to pay €10 more for entry. Day passes could also be purchased for €10/€15 for Saturday and €7.50/€15 for Sunday, as could T-shirts (€17.50), raffle tickets and other NFV merchandise. 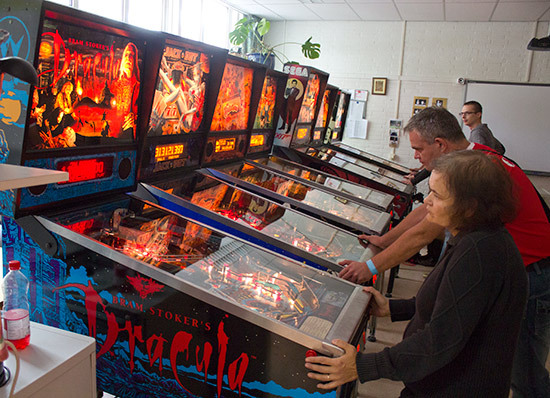 The main DPO tournament was held in the school's sports hall, but the bulk of free play machines were set up in the main hall with numerous other classrooms playing host to smaller groups of machines. 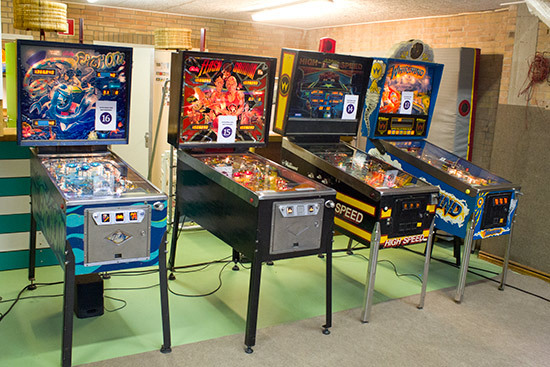 In the first side room - on the right as you entered the main hall - was a collection of 13 machines including Truck Stop, Austin Powers and Escape - one of four models produced by Dutch pinball maker Jac van Ham in the late '80s. 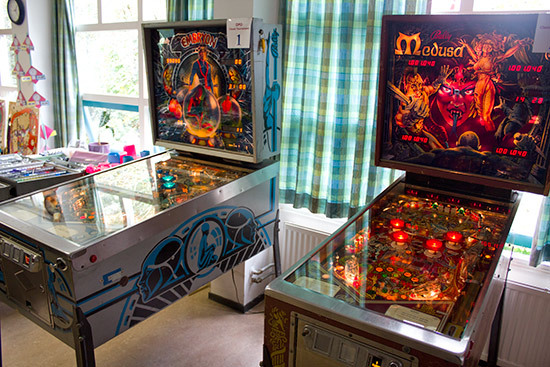 Further down on the right of the school's main hall was the second side room filled of machines. 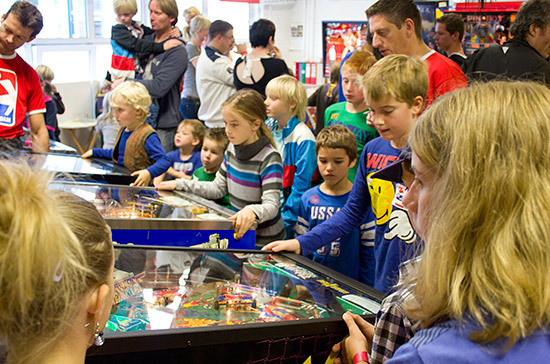 On Sunday this room was devoted to educating children about the fun pinball can provide. There was also a Kids Tournament held here. Unfortunately we were a little busy playing in the main DPO tournament to cover it, but the winner was Timber Engelbeen from Gent in Belgium. On the left as you entered the main hall was the third side room, which was used for the Country Tournament on Saturday and the Ladies Championship on Sunday. We'll look at the tournaments a little later in this report, and continue our tour of the school with the next room on the left. This backed onto the Country Tournament room and was used for the Classic Tournament. 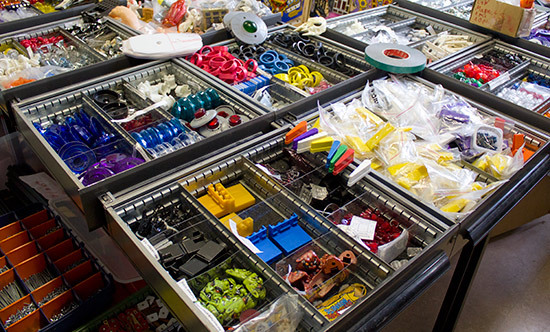 Also in this room was a stand for High Class Pinballs offering an extensive range of parts, as well as new playfields for Medieval Madness, Twilight Zone, Funhouse, Attack from Mars, Elvis and Shrek. 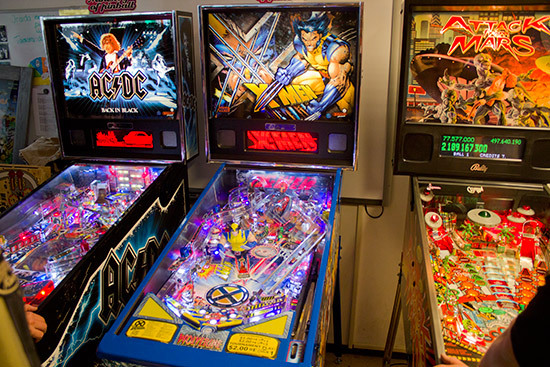 The fifth side room was reserved for some particularly interesting machines - the newest models from Stern, a ColorDMD machine and two custom P-ROC-based games. The Stern models were AC/DC Back in Black and X-Men Wolverine. 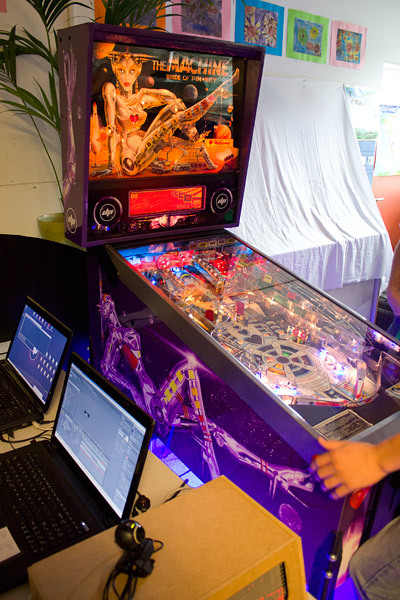 They were joined by an Attack from Mars with a ColorDMD display. 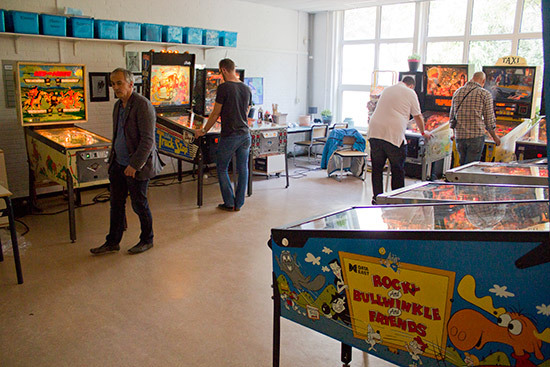 The new Stern games were provided by Ministry of Pinball who also had a stand in the room selling pinball parts, more playfields including Scared Stiff and Whoa Nellie - Big Juicy Melons, along with a range of mods and toppers. 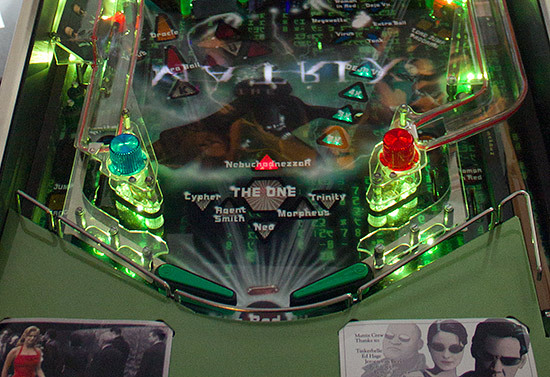 At the end of the Ministry of Pinball table was the first of the two P-ROC custom games - The Matrix. 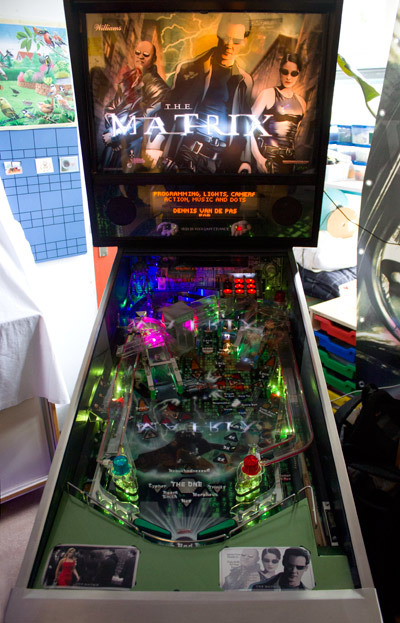 Based on the Johnny Mnemonic playfield, The Matrix was created by Pinnovating.com and completely re-themes the playfield to fit the movie series with new artwork, plastics and EL-wire-trimmed ramps. It also includes speech from the movies, custom sound, new translite art, new rules and new display effects on the DMD. You can watch a video of The Matrix by clicking on the image below. 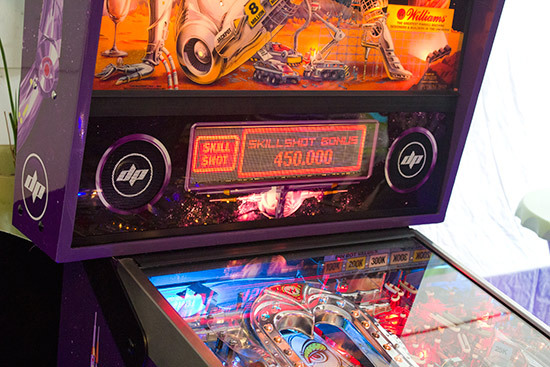 The second game was The Machine - Bride of Pinbot from Dutch Pinball with a dot matrix display, all new rules, and new sounds and music. We've featured this machine before, but this appearance demonstrated the recent progress in rules development and the addition of the custom soundtrack. 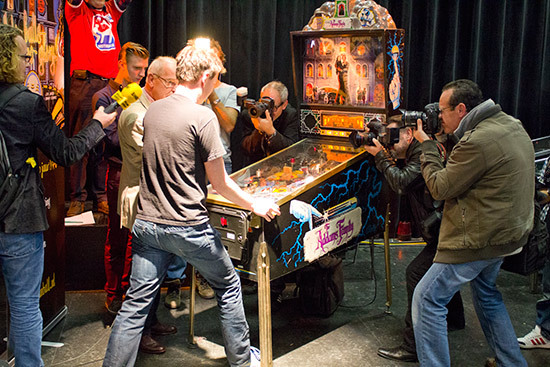 To watch these videos at different resolutions, or to watch any of our other videos, visit the Pinball News Videos channel on YouTube at youtube.com/pinballnewsvideos. 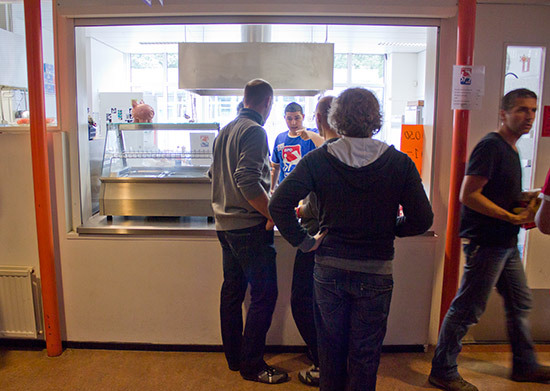 At the front of the main hall was a bar selling beer, wine, soft drinks and chocolate bars. At the back were the kitchens where guests could buy hamburgers, sandwiches and french fries. 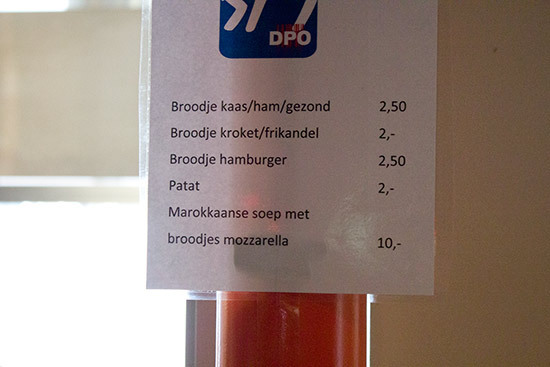 Prices were very reasonable at €2.50 (£2.00, $3.20) for a burger, the same for a ham, cheese or a 'healthy' sandwich, €2 for a roll with either a croquette or a hot dog sausage, and €2 for french fries. Purchase of the food, as well as any drinks or snacks, had to be made using tokens purchased from the front desk, which makes things a little more awkward than simply using cash. 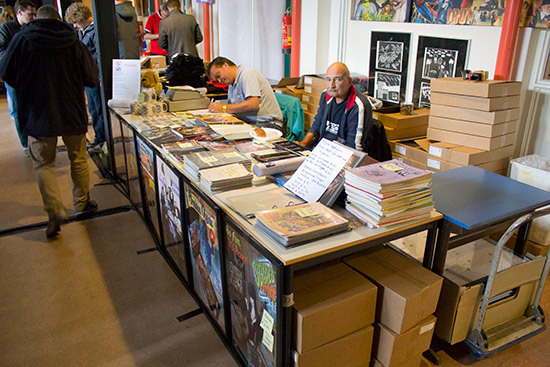 Also inside the main hall were two more vendors. 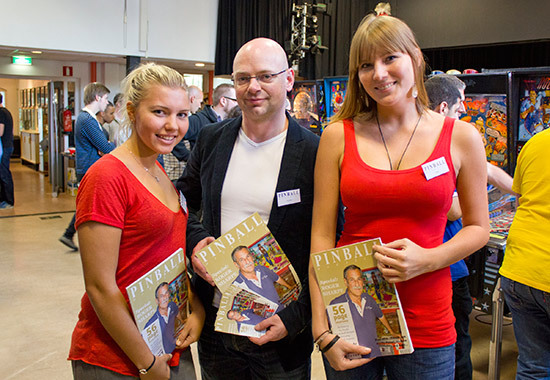 Jonathan Joosten was there with his persuasive promotional team, selling copies of Pinball Magazine. 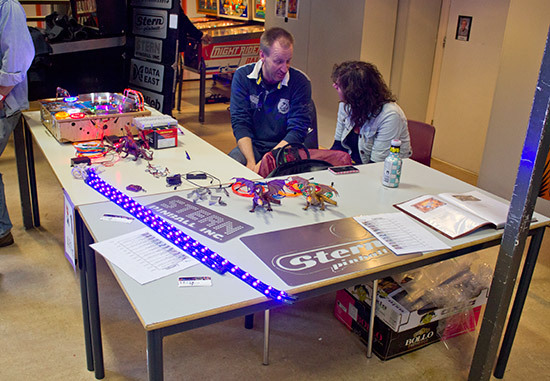 Also in the main hall were LED4Pin who had an assortment of LEDs, LE wire products and game mods for sale. 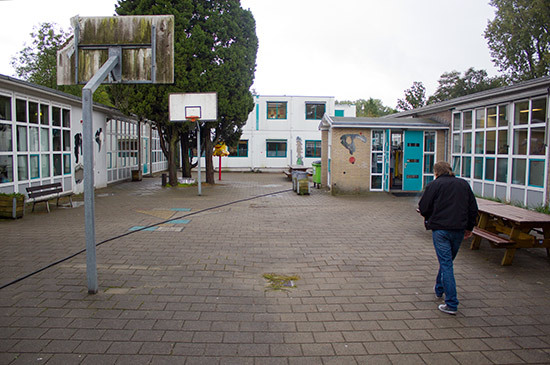 To reach the site of the main DPO tournament competitors had to cross the courtyard, which also provided seating for those wanting to eat their lunch al fresco. The main scoring system was located in the entrance lobby, along with a large LCD monitor showing the rankings and tournament progress. 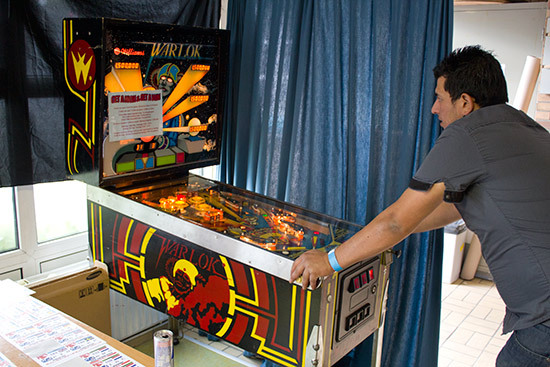 Next to the computer desk was a lone Warlock machine which was used for a high score competition costing €1 per entry. There was a minimum threshold of 1.5M below which scores were not recorded but the highest scorer at 2pm on Sunday would win the cash box prize. All was going well until Dutch wizard Roy Wils scored over 5 million which effectively brought the competition to a close as nobody else thought they could beat that. 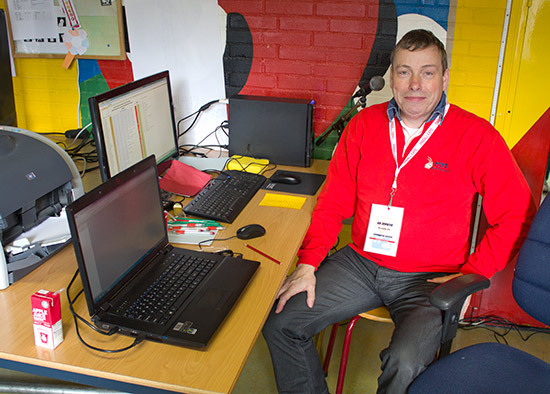 The main DPO tournament was run, as usual, by Ad Jonker. This year the system for entering scores changed a little. 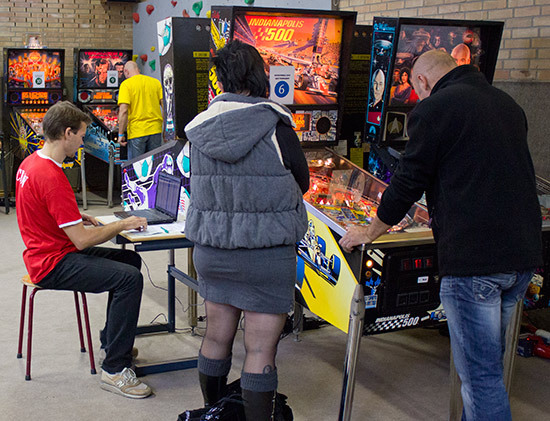 Instead of all scores being recorded on paper and then entered by Ad, there were three laptop terminals set up in the games room and scores could be entered by marshals on any of these as soon as games were over. 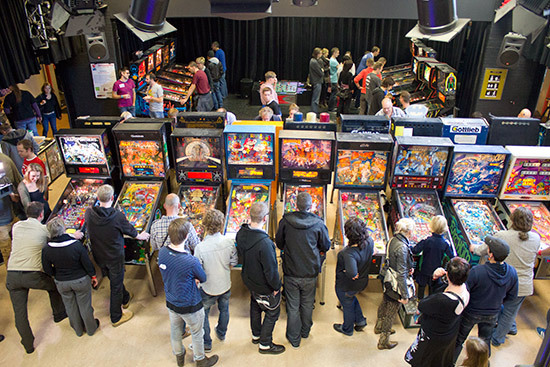 There were 20 machines from which competitors chose 6 to play. 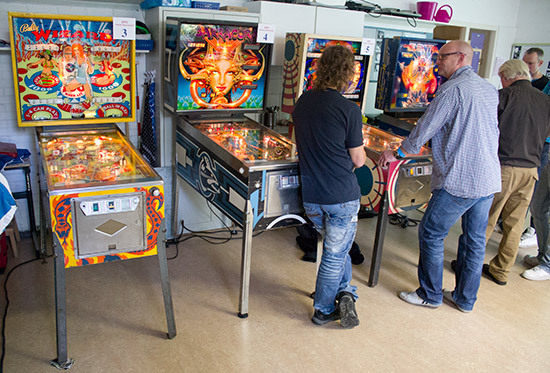 You can watch an exclusive tour around the Dutch Pinball Open with our Five Minute Tour. Just click below to watch it. 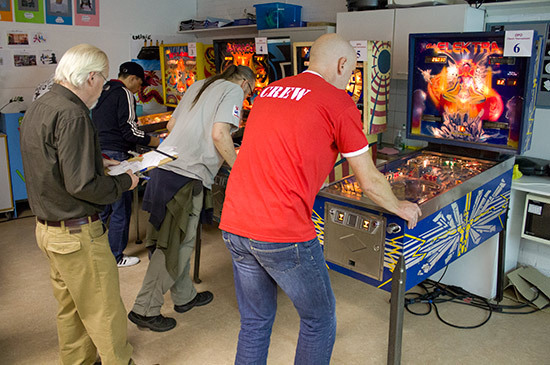 The DPO main tournament's qualification round took place in two sessions on Saturday, so that those who were also taking part in the Country Tournament could play their DPO games before getting too wrapped up in the team event. 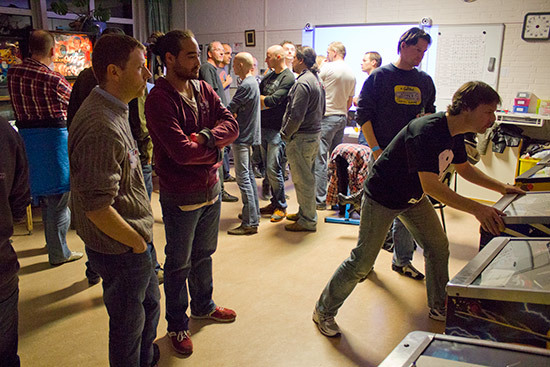 Competitors played a single game on each of their six chosen machines and ranking points were awarded according to how their score compared to other scores on the same machine. The total of the six ranking points was their total score. 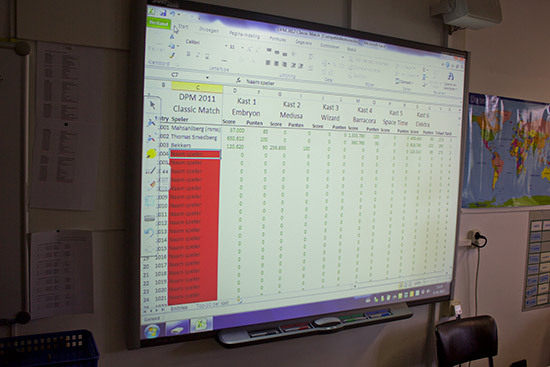 In addition, the DPO utilised the joker system where a competitor could replay one of their games to try to improve their score. If they managed to do better the second time, the new score replaced the old one, otherwise the original score stood. There were 134 competitors, from which the top 41 qualified for Sunday's play-off rounds. They were joined by 7 players who had pre-qualified through the NFV's own competitive events to create a group of 48. The top 16 qualifiers from Saturday received a bye through the first round of Sunday's play-offs. In addition, two qualifying players were not able to attend on Sunday, letting two stand-by players back into the tournament. As the DPO qualifying was being decided, the Country Tournament and the Classic Tournament were taking place back in the main building. Each team played a match against each of the other five teams in their group. 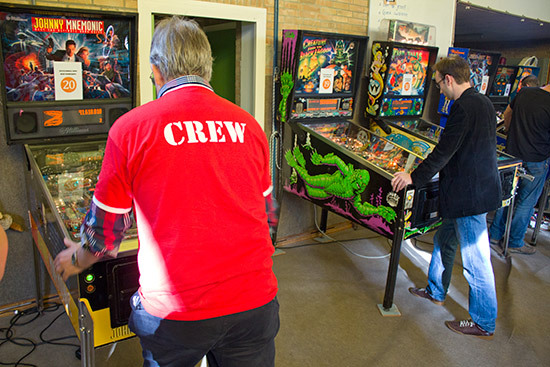 A match consisted on one 2-player 4-ball game where each team member played one ball for their team, followed by two 4-player 3-ball games where two players from each team compete on one machine and the other players compete on a second machine. 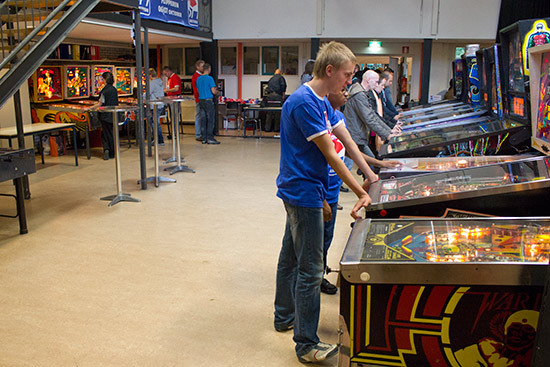 Nine points were awarded for winning the first 2-player game. 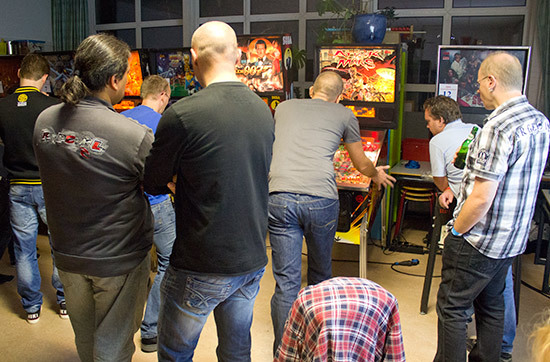 In the 4-player games, five points were awarded to the winner, two points for second, one for third and no points for fourth place. Once all three games had been played, the team with the highest number of points had won the match and received 2 match points. 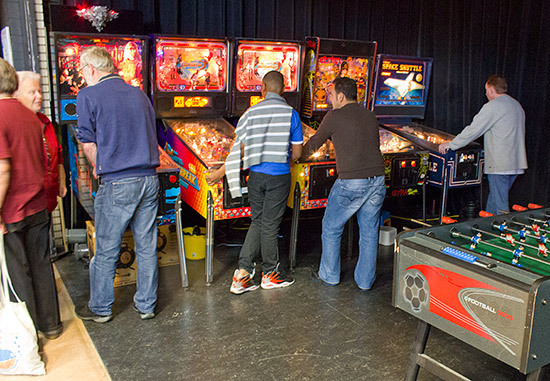 Match pairings and machines to be played were pre-selected with matches taking place approximately every hour, plus a break for dinner. When all the matches had been played, the top two teams in each group went through to the final round which was played in the same way as the first round, except everyone was in one group. The play-off then followed to decide the overall winners. 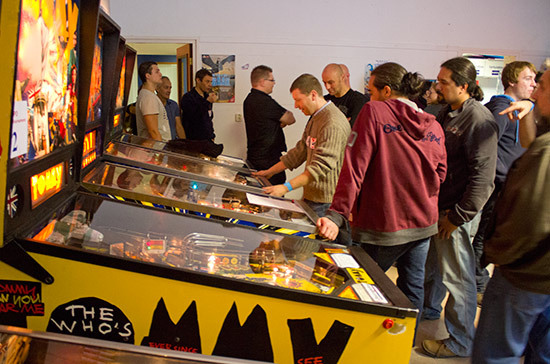 The final round went on late into the night - far too late for us to stay without having eaten all day - but in the end it was the Pinball Wizards team from The Netherlands who triumphed and took first place. Meanwhile, on the other side of the wall, the qualifying round of the Classic Tournament was under way. The system here allowed players to buy unlimited entries for €3 each where each entry consisted of three games on any of the six machines available. 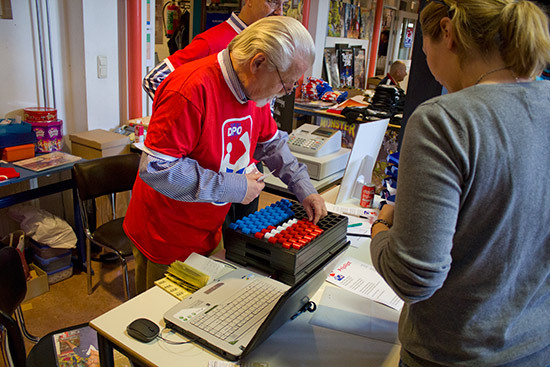 As in the DPO, ranking points were awarded for each score and the total of the three games' points gave an overall position. Each entry was taken in isolation, which meant in order to do well you needed to have three good games in a single entry. 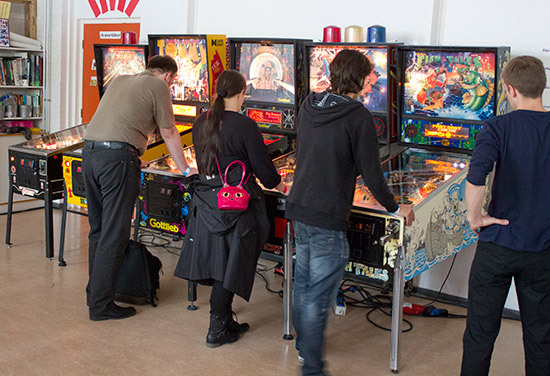 There was also the danger that a single good score in an otherwise poor entry could knock one of your earlier scores down the rankings. So you could scratch your entry if it wasn't going to help you. It was also possible to play tactically and aim to knock down the score of your closest competitors if you so wanted. Tactics would probably have gone out the window anyway when Space Time broke down and was taken out of the tournament, leaving just five from which to choose. 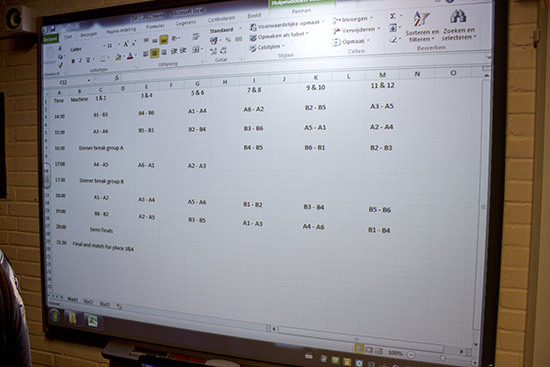 Current rankings were shown in a spreadsheet on a projector screen. We are still waiting for the results of the Classic Tournament and will update this report just as soon as we get them. 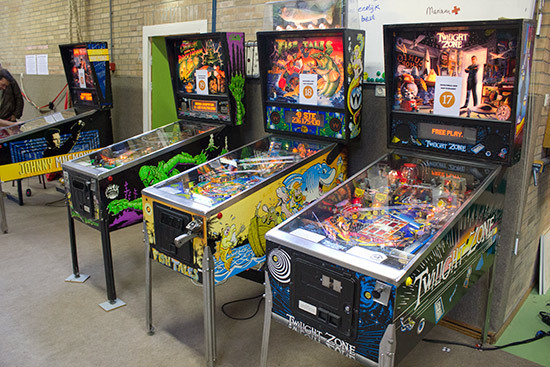 Back in the DPO hall, there were a few swaps on Sunday in readiness for the play-offs as Flash Gordon, Fathom and Twilight Zone were replaced with The Flintstones, No Good Gofers and Jackbot. 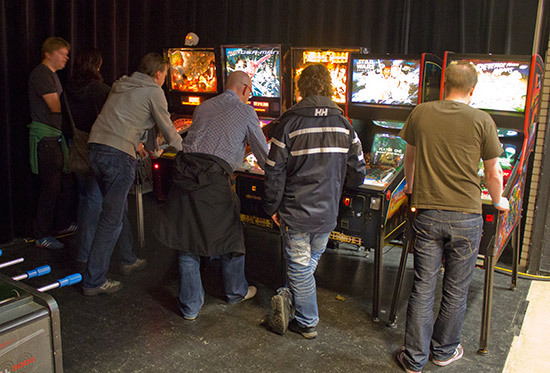 The format for the DPO play-offs was double-elimination, where each match consisted of best-of-three head-to-head games, each played on machines drawn at random. Whoever won two games won the match and continued in the winner bracket. 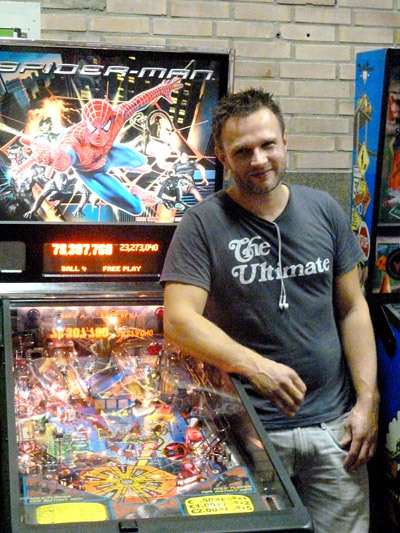 The loser went into the loser bracket to play against another losing player in a single 4-ball game on a random machine. Those who lost in the loser bracket were out. Those who won continued in the loser bracket and eventually had the chance to get into the final. That final took place between Albert Nomden who had won all his matches to win the winner bracket, and Jasper van Eeden who he had beaten in the semi-final, but who won the loser bracket to get into the final. The final took the same format as the winner bracket which is a best-of-three match. 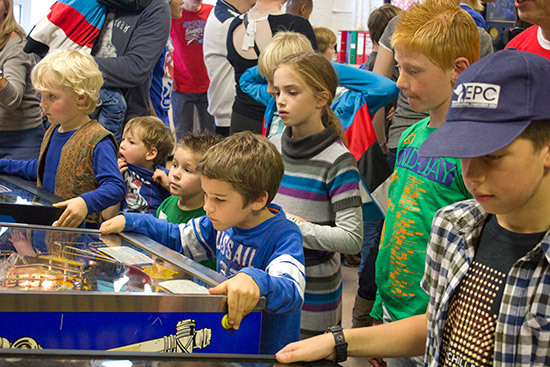 This time each player could choose a machine to play and a third - if needed - would be drawn at random. 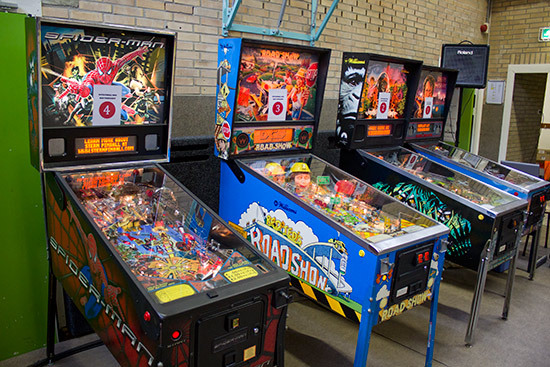 Jasper choose Johnny Mnemonic, Albert choose Red & Ted's Roadshow, and the third game drawn at random was Spider-Man. There was a delay while a switch fault on Johnny Mnemonic was attended to. 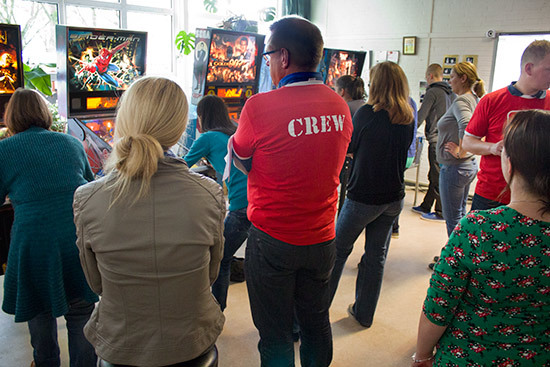 Eventually it was decided to play the second game on Roadshow while the fault was repaired. Albert won that game, which meant Jasper had to win both remaining games if he was to win the final... which is exactly what he did, completing his comeback on Spider-Man. 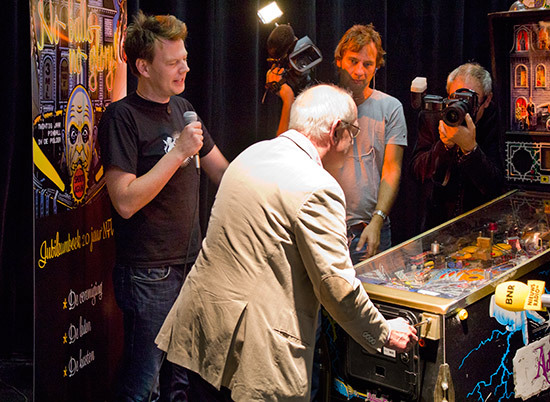 So Jasper van Eeden became the new Dutch Pinball Open champion for 2012. Also taking place on Sunday was the Ladies Tournament, which was held in the same room as the Country Tournament. Entry to this tournament cost €7.50. 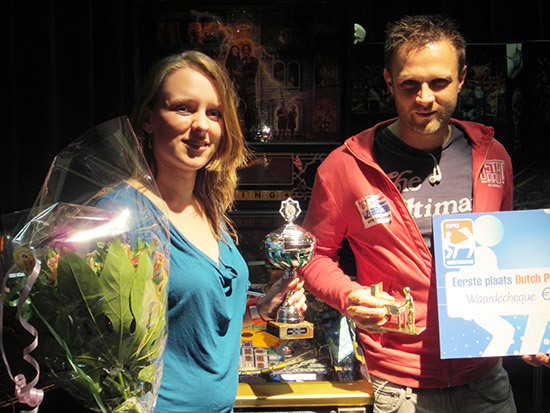 The winner was the organiser of the Country Tournament, Jasmijn de Jong. Also on Sunday there was a special presentation to mark the NFV's 20 year anniversary. 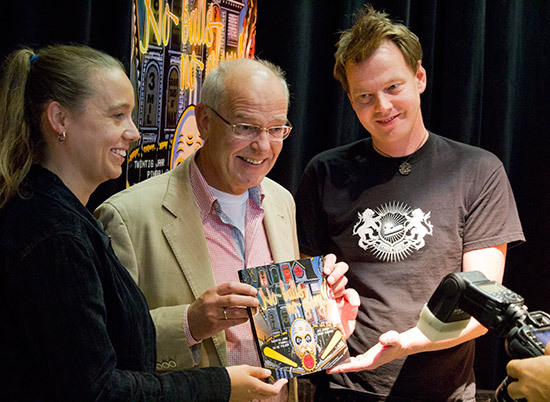 A commemorative book, No Balls, No Glory, had been produced and one of the book's authors Jim Jansen was there to present a copy to the former Dutch Finance Minister and Deputy Prime Minister- and now CEO or the bank ABN AMRO - Gerrit Zalm, who is a long-time pinball fan. 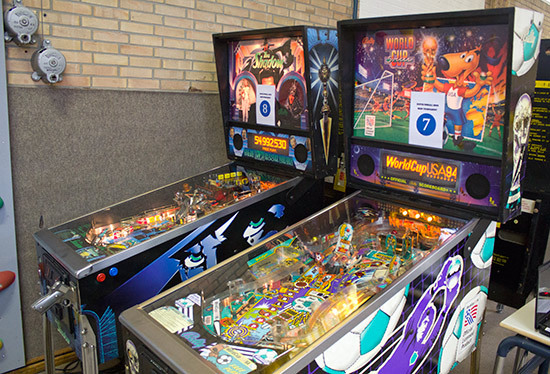 As the cover of the book depicts the playfield from The Addams Family, a special game of pinball was then played on that very machine. 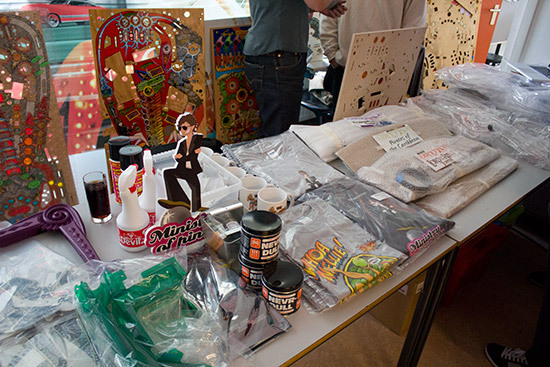 Finally, there was the raffle draw where the top prize was a Stern Monopoly machine. 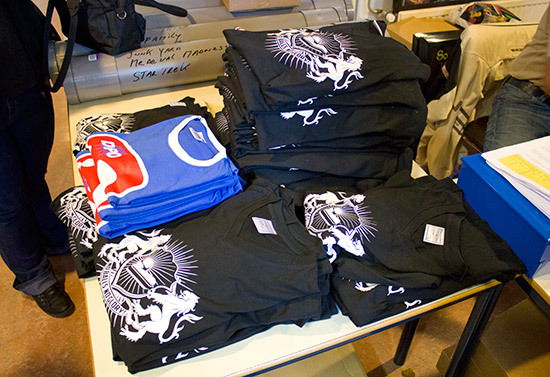 There were many other prizes of clothing, pinball parts, suitcases and much more to win. Tickets could be bought either at the front desk or as part of the pre-registration package. 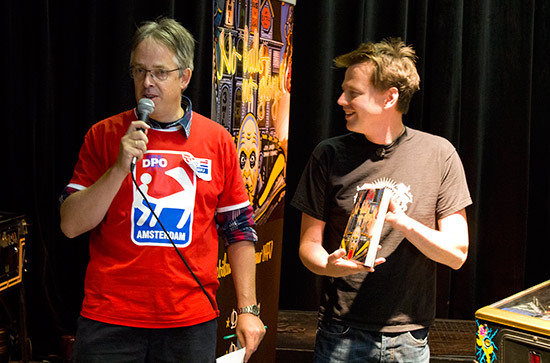 The top prize of the Monopoly was won by Pieter Stoffelen. 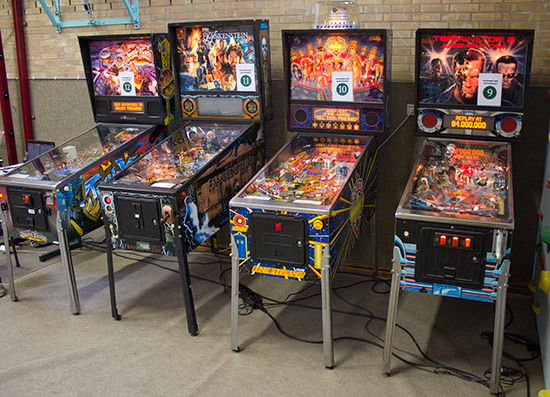 That brings us to the end of this report from the 2012 Dutch Pinball Open. 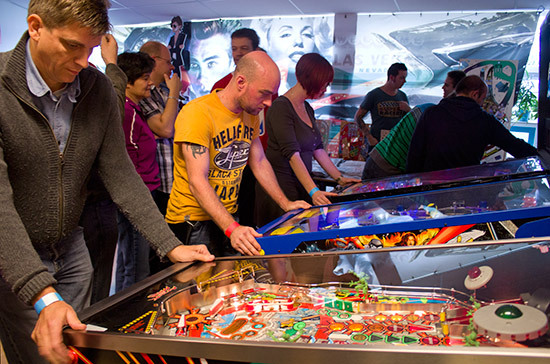 Next year the event moves on to another city, so check the Pinball News Diary for details as soon as they are announced.